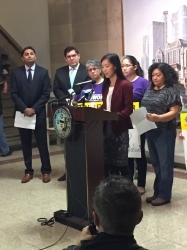 Defend and strengthen the Welcoming City Ordinance: Chicago is one of many cities across the country that have limited its local law enforcement’s collaboration with Immigration and Customs Enforcement (ICE) in order to protect undocumented residents from deportation and to prevent being detained by ICE. President-Elect Donald Trump has threatened to take away federal funding for so-called “sanctuary cities.” In order for the Mayor to live up to the commitment that Chicago remain a city that welcomes immigrants, Chicago has an opportunity to strengthen the ordinance, including removing categories of individuals exempted from protection under the Ordinance, and treat all residents fairly and equally in the City of Chicago. Improve emergency response systems for immigrants and people with limited English language proficiency: Establish greater response procedures to address hate crimes on immigrants, including making resources available for immigrants to access important legal information, such as whether they would qualify for a U visa, a visa that improves law enforcement’s ability to investigate and prosecute crime and also protects immigrant survivors of crime. 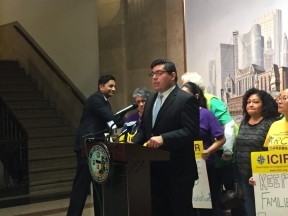 In addition, because there is currently a backlog of U visa certifications in Chicago, the City should alleviate the burden on the Chicago Police Department by expanding U visa certification to other qualifying municipal agencies. Additionally, the City must ensure emergency services are equipped to assist people with limited English Language proficiency. Although the City is in the process of making language access a priority, emergency services and 311 operators are still not equipped to assist non-English speakers.